Are you thinking of availing a small clothing boutique business loan? There are many loan lenders in India who offer business loans to small clothing boutique business. The loan amount can be required for investment in renovation or to stock inventory. Cash is required to expand a small clothing business as well. Let’s take a look at how to get a loan for a small clothing boutique. Do your homework means to understand why there is a need for a business loan. Also, reckon the amount required. It is important to search for all the options for financing. And establish if there is any other option of availing extra finances. If there are not any, then you must opt to avail a small clothing boutique loan. Additionally, it is also important to research the ongoing trends in the market. And with that, figure out the money required. It is also important to outline where the money will be used. Before applying for a small boutique financing, know your business health and be sure that you will be able to repay the loan amount. Also, know your credit score. Ideally, the credit score must be above at least 650-700 for a loan for the business. Also, a credit score means that the interest rate will low since the risk for the lender is also low. The other important factors to determine the business is the debt to income ratio, time in business (vintage), industry risk profile, and cash flow statement. After finding everything about your clothing boutique in India, now it is the time to search the lender and know about him. There are n numbers of lenders who offer loans for the boutique. But not all of them are the right one for you. Now that you know your needs and your position in terms of loan amount requirement and credit score, shortlist the lenders whose offer meets your requirements. The other things about lenders to search are his interest rate, terms and conditions, documentation requirement, eligibility criteria, etc. Also, know the lender’s application approval process and the time they take for it. One the homework is done and the right lender is selected, it’s time to get the paperwork done. The paperwork here means the documents required by the lender. However, it is important to arrange for documents before applying for a loan for a small clothing boutique. If you would have the documents beforehand, you will be able to offer them to lender early. And in return, they will be able to process your application early. Applying for a loan for a business is the last step here. Sometimes, the entire step can be stressful or time-consuming. However, if you apply for a clothing boutique business loan online, it will be absolutely hassle-free. You can fill the loan application online and also upload the documents online. Also, these online lenders would keep you updated with the application process via SMS and emails. 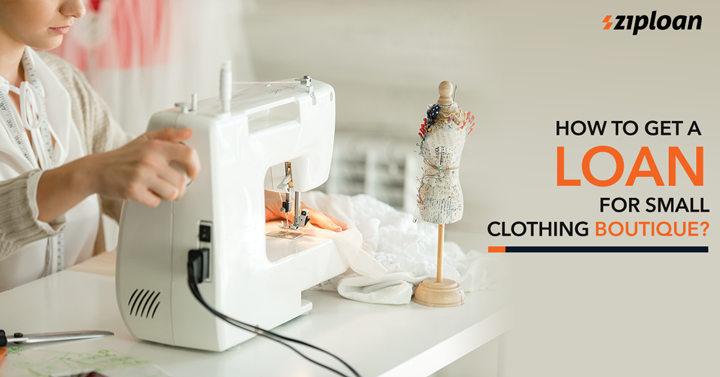 Now that you know the steps to avail a business loan for a small clothing boutique, you can apply for a loan in the time of need. You can also register your business at the Connect App by ZipLoan for free, and connect with other boutique owners and grow your business network. Previous article Spices Traders: What Are The Most Profitable Spices To Export? Next article Bakery Business: How To Write A Bakery Business Plan?